Hey busy person, how do you remember God? 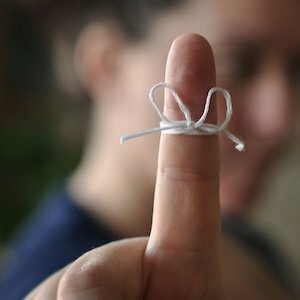 Did you ever tie a string around your finger to remember something? Not sure why, but that was a common solution in books I read as a child. I tried it once. All I got was a purple finger. Since childhood I’ve been distractable. Maybe it’s undiagnosed ADD, or just the fruit of a very busy mind and a performance-orientation. I’m not sure. Urgent things grab my mind. No matter how important my other goals are, the urgent things always seem to win. This has proven to be a hurdle in my spiritual life. It’s important to me to connect with God throughout the day. My level of peace and happiness is always better when I do. Yet the urgent things around me never fail to keep my mind pre-occupied. Of course this means another day slips into the past, and I spent it with my heart and mind fully occupied with the urgent. This is not who I want to be. It’s not who you want to be either. Are you Going or are you With? This year I’ve been living with a new distinction in my mind about my relationship with God. Either you can live a “Go to God” kind of life, or you can life a “With God” kind of life. Almost all religion is a “Go to God” kind of life. You go to certain places, times and people in order to connect with God. You attend a worship service or a Bible study. You sit down with your pastor. You go to those places for your spiritual refuel. Sort of like taking our cars to the gas station. We need to fill-up so we can make it through. Now these practices aren’t bad in themselves, but the mindset of going to God is a problem. Why? Because it means that everything else in my life isn’t spiritual. If God is to be found in a special building, or during a special event, or through the guidance of a special person, then the rest of my life seems to count less. This results in a compartmentalized way of living, where most of my life is unteathered from Jesus and His way. In John 15 Jesus invites us to live a different kind of life. With the metaphor of a branch and vine, Jesus tells us about a constant-on connection with God. Instead of going to God to get what we need, we live continually connected to God, through Jesus Christ. We may still go to worship services and Bible study, but those serve a different purpose. They aren’t for tanking up. We are tanked up and guided as we live our every-day normal life in God’s presence and with God’s guidance. Do you want to try a daily step? Now, I don’t have a guaranted method for how to make the shift. Living a With-God life is a whole new way of thinking. I’m in experimentation mode. I invite you to do the same. If your life is busy, you’re not excluded from spiritual growth. Jesus wants to be a present part of your day. That’s why I wrote the “Not Just One More Thing: Spiritual growth for Busy People” eCourse. (Get it for free by subscribing to my blog update. Right there on the side bar. Just your name and email. No spam ever, I promise. More about it here. ) It will give you some practical ways you can start living a With-God life. The Daily Steps all look like this. Different picture, different words–but like this. Easy to digest. Easy to share. Maybe you’re like me in another way. Maybe spiritual growth and a focus on God is important to you, but the urgent things in your life keep you off balance. Maybe you just have a hard time remembering to keep that spiritual focus during your day. I know how that feels! So, I’m trying something else. Maybe you’d like to join me. Over on my Facebook page I’m trying a 30-day experiment. Every day for 30 days at 9:00 AM I’m putting out one simple do-able thing. I’m calling it The Daily Step. These are all actions. They are something you can easily weave into your day, no matter how busy. I’m committed to try these things throughout my day, and I want to invite you to join me. 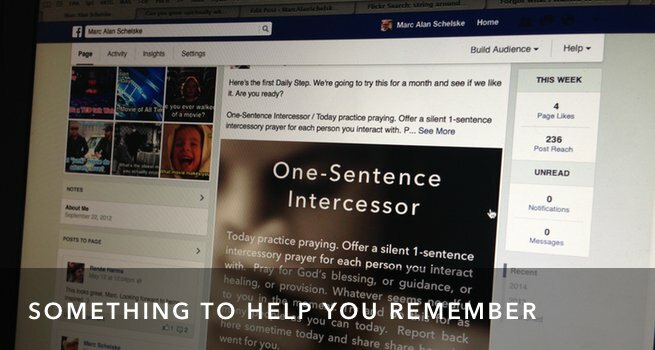 You can use the automagical power of technology to help you remember! Go Like my Facebook page. Turn on Page Notifications so you don’t miss anything (Here’s how) . 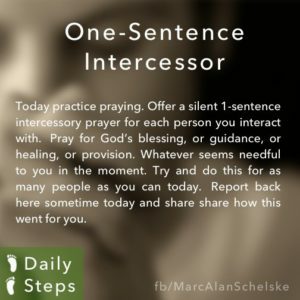 Then watch for the new Daily Step post every morning. Try it out during the day. Report back how it goes. Let’s learn together, OK? How do you remind yourself to stay focused spiritually throughout the day?